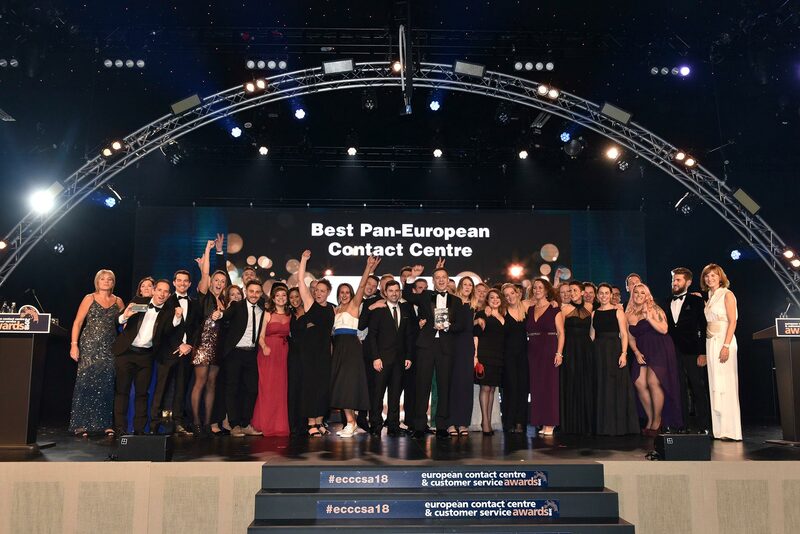 The European Contact Centre & Customer Service Awards have always seemed to be in my life. Many moons ago I remember participating with clients during my Merchants years. Those were the days when I was still in the thick of it during the dance floor part of the night. Some of the after parties that followed lasted till dawn. These days I tap into the energy on stage looking out at a sea of lean-forward faces waiting to hear the winning name as the gold envelope is ripped open. I love the energy boom that follows. By the way if you get the chance to announce an award just make sure you put both lungs into it. The ambient hum of excitement grows throughout the night and must be topped to set off the best boom. Although the tradition has currently halted, I’m also a very proud ECCSA lifetime award winner (2015). The trophy sits pride of place at home. It was really amazing to be recognised by peers. It’s something that every ECCCSA category winner remembers as a peak personal experience. So as you can tell, I have every reason to be a bit of a fan. It is also an award event that keeps evolving. Those after parties with the UBM/ICMI team were outstanding fun. Now things have moved on and been reinvented as a truly European challenge under the stewardship of Anne Marie and Keith Stagg. It’s just as amazing to be recognised as the best in Europe for a particular category. There is a lot of kudos in hitting that pinnacle. The brand and personal PR is great. Best practice site visits and conference speaking slots are pretty much guaranteed for those who want to keep amplifying their success. And of course taking the award back home and being congratulated by colleagues is just bliss for those who enjoy the spotlight and thrive on recognition. Winning is great. But it’s not winner takes all. Simply being a finalist and taking the team to the awards dinner is always a much appreciated validation for all the hard work during the year. And remember if you are a silver or bronze winner that still puts you at the top of the European customer service leaderboard. Even if you just get as far as entering a category, you have still set a milestone on your journey to excellence. I know many organisations who intend to enter but feel the timing is not yet right and so are waiting for a future opportunity to go public on a transformed capability. So there are plenty of reasons to enter if you feel the time is right and the team is ready to be judged on what they have worked hard to generate. There are also plenty of reasons to be a judge. Primarily it is inspiring and the fastest way to keep up with what the best brands are up to. It is also a lot of fun with the other judges and of course the site visits are a great excuse to get first-hand experience of the kind of iconic brands who are drawn to enter. So please have a go. Check out the categories. There are plenty. If 2018 is not the right time, set the ambition with the team as something to aim for. One aspect of customer experience that has yet to make it into a competitive category is emotion management, especially in the context of customer interaction. This is something that I predict is going to change simply because it is at the heart of delivering customer experience and I believe is something that service leadership needs to be actively managing instead of simply relying on the engagement skills of individual advisors. And that’s only the live channel I’m talking about. What does emotionally congruent self service look like? Is it fair to even expect this of chatbots anytime soon? Or is the empathy shown in recent Google Duplex demonstrations a sign of things to come? It is time we developed industry wide capability. To that end, I’m kickstarting an industry discussion in the form of e-books, a road show and survey. The survey is an attempt to snapshot current capability. So far, the results are fascinating in revealing where the gaps sit. I’d really appreciate your point of view on what could easily become a new ECCCSA category in a few years time.